In the holidays my extended family went on a holiday to the Blue Mountains. We had a great time, and for Mothers Day I made Mum a little album of photos we took of all the family members enjoying Leura. 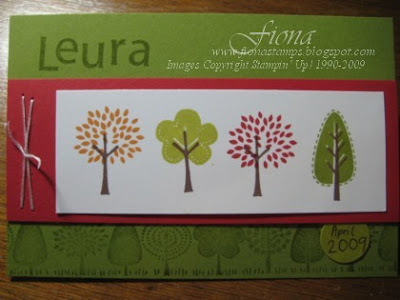 I used a slip-in 10x15cm album, and made a title page and end page using the Trendy Trees set, my latest favourite set. I also used the coordinating wheel at the bottom of the page. Lots of fun.